SEM images and crystal structures of (from left) conventional anatase nanoparticles, nanosheets, and nanotubes. From “Location of Hole and Electron Traps on Nanocrystalline TiO2,” Candy C. Mercado, Fritz J. Knorr, Jeanne L. McHale, Shirin M. Usmani, Andrew S. Ichimura, Laxmikant V. Saraf, J. Phys. Chem. C 2012, 116, 10796-10804. TiO2 is an earth-abundant metal oxide of wide-ranging importance in energy applications, most often in its nanoparticulate form. The high surface area-to-volume ratio of TiO2 nanoparticles results in tremendous influence of surface defects and contacting media on their performance in photocatalysis and solar energy conversion. These defects result in deep intra-band gap states that impede carrier transport – these are the bad traps. But shallow traps may contribute to carrier transport, which occurs via the rather inefficient process of diffusion, so these might be considered good traps. It’s important to understand the chemical nature of these traps so that they could be manipulated for a particular application. 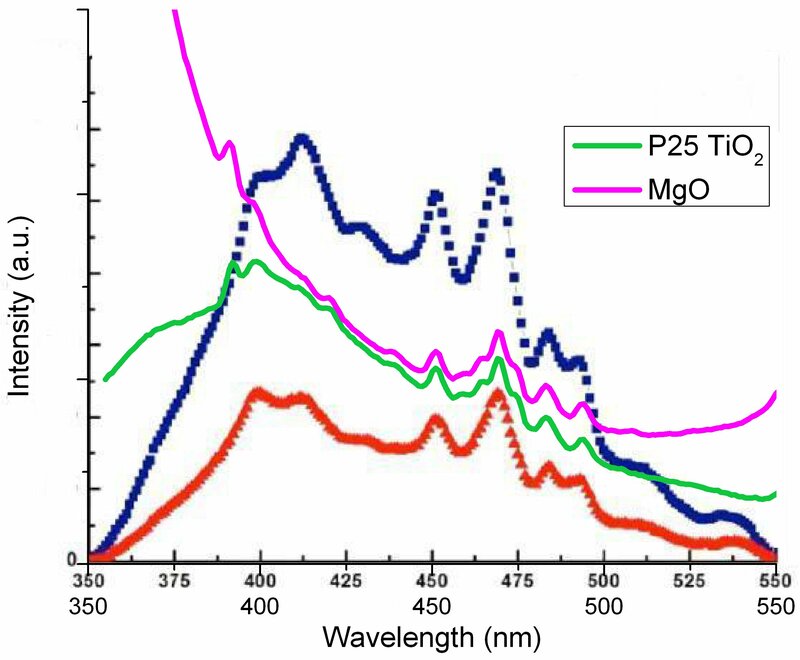 As an indirect band gap semiconductor, TiO2 shows no band gap photoluminescence, but illumination with ultraviolet light results in broad visible photoluminescence (PL) arising from recombination of oppositely charged trapped and free carriers. In the past several years, we have made great strides in understanding the nature of this PL as a function of solvent environment, nanoparticle morphology, and applied bias. Researchers who contributed to this work include former postdoc Dongshe Zhang, adjunct chemistry faculty Fritz Knorr, and Candy Mercado, PhD 2012. Trap state distributions and photoluminescence spectra of nanocrystalline anatase TiO2. From “Photoluminescence of Dense Nanocrystalline Titanium Dioxide Thin Films: Effect of Doping and Thickness in Relation to Gas Sensing,” Candy C. Mercado, Zachary Seeley, Amit Bandyopadhyay, Susmita Bose, Jeanne L. McHale ACS Applied Materials &amp; Interfaces 2011, 3, 2281-2288. A series of studies of TiO2 PL in different samples has led to the above model for trap states of TiO2 in the anatase crystalline modification. The normal emission of anatase nanoparticles is dominated by PL arising from the recombination of trapped electrons with valence band holes, leading to a broad spectrum with a peak in the red. Also present is a higher energy emission (“green PL”), arising from the recombination of mobile electrons with trapped holes, which we assign to oxygen-vacancy color centers. Because both types of recombination depend on the spatial coincidence of trapped and mobile charges, the PL intensity is greater when transport is hindered (as in dense TiO2 films used for gas sensing), and lower when the charges are more mobile (as in sintered porous films used for solar energy conversion). The PL is quenched by oxygen at the surface, so as shown above, the PL of porous films is much more strongly affected by oxygen than that of dense films. Photoluminescence of nanocrystalline anatase in different solvent environments (left) and in water at pH 1.8 under applied bias (right). From “Trap State Distributions and Carrier Transport in Pure and Mixed Phase TiO2: Influence of contacting solvent and interphasial electron transfer,” Fritz J. Knorr, Candy C. Mercado and Jeanne L. McHale, J. Phys. Chem.C 2008, 112, 12786-12794. and “Spectroelectrochemical Photoluminescence of Trap States of Nanocrystalline TiO2 in Aqueous Media,” Fritz J. Knorr and Jeanne L. McHale, J. J. Phys. Chem. C in press. As seen above, the PL is very sensitive to contacting media (left) and the presence of an external bias. In either case, raising the Fermi level causes the red PL characteristic of electron traps to convert to green PL characteristic of hole traps. Spectro-electrochemical measurements of the PL (SEPL) of TiO2 films in aqueous media have allowed us to control the Fermi level and derive the pH dependent redox energies of electron traps. We have determined that the red-emitting traps are under-coordinated Ti4+ centers which are reduced to Ti3+ in a proton-coupled process. a) The (001) and b) (101) surfaces of anatase TiO2 showing five- and six-fold coordinated Ti. c) The Wullf construction of an anatase crystal showing the large proportion of (101) facets. We have examined the PL from conventional nanoparticles, which expose a lot of (101) surfaces as shown above, and compared it to that of nanosheets with a great deal of (001) texture. This led to the hypothesis that the oxygen vacancies which result in green PL prevail on the minority (001) surface. Spectro-electrochemical studies of nanosheet samples are underway to test this hypothesis. Optical (left) and false color PL images of emission from a single TiO2 nanotube. The PL images illustrate remote green emission from mobile carriers. From “Observation of Charge Transport in Single Titanium Dioxide Nanotubes by Micro-Photoluminescence Imaging and Spectroscopy,” Candy C. Mercado, Fritz J. Knorr, Jeanne L. McHale, ACS Nano 2012, 6, 7270-7280. TiO2 nanotubes prepared by anodization of Ti metal have attracted a great deal of attention owing to their potentially better transport properties. Specifically, it was believed for example that in solar cell applications using nanotubes, electron injection would result in ballistic transport of electrons along the length of the tube. In her PhD thesis work, Candy Mercado observed the first PL images of individual TiO2 nanotubes, as shown above. There were a number of surprises in this work. The much weaker PL from TiO2 nanotube arrays results from the lateral transport of carriers in the direction orthogonal to tube growth. In collaboration with Laxmikant Saraf at Pacific Northwest National labs, we learned that TiO2 nanotubes expose different crystal facets than those commonly seen on anatase nanoparticles. This highlights a recurring theme in the study of surface defects: they depend on the crystal facet and the shape of the nanoparticle. Ongoing studies of spectro-electrochemical measurements of TiO2 nanosheets and nanotubes are being pursued by graduate students Lyra Chistianson and Riley Rex. The above data appeared in a paper in the Journal of Physical Chemistry C and was claimed to be the emission of TiO2, but it is in fact the spectrum of the xenon lamp excitation source which is scattered by the sample. See our cautionary tale: “Comment on ‘Characterization of Oxygen Vacancy Associates within Hydrogenated TiO2: a Positron Annihilation Study,’ by Jiang, J. et al.,” Riley E. Rex, Fritz J. Knorr and Jeanne L. McHale, J. Phys. Chem. C 2013, 117, 7949-7951. Beware of bogus TiO2 photoluminescence! The photoluminescence of TiO2 is weak and easily quenched in air, and the samples are highly scattering, so great care is required to reject stray light that imitates PL. Sadly, a number of papers report erroneous PL spectra similar to that shown above. This is not the PL of TiO2, it is a spectrum of the xenon lamp used to excite the sample in a commercial fluorimeter. With careful use of filters, or a double monochromator, and with exclusion of oxygen, an ordinary fluorimeter can be used to look at TiO2 PL. However laser excitation of the sample is preferred. Care must be used to limit excitation power which if too high can result in a blue-shifted spectrum (the Burstein-Moss effect).